First of all, I have to apologise. 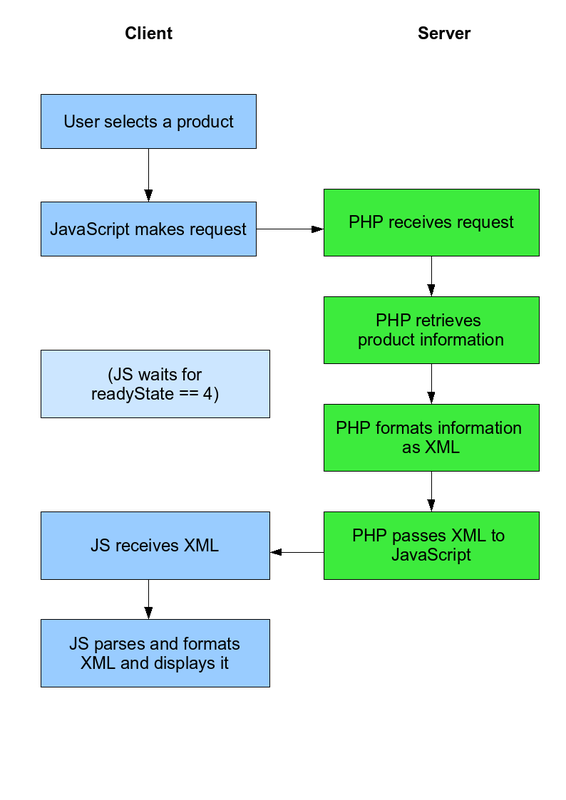 It’s been literally two months since my last post in this series, and it’s been more than that since I last looked at Ajax in PHP. OK, I might admit it, it was this comment that motivated me to pick up this series again. Oh, that and I’m now on the half term break, so I’m finally getting round to some things that have been on the back burner for a long time. In our last Ajax tutorial, we got started with Ajax using PHP and made our first Ajax application. A web server running PHP (I’m using PHP 5, but it might work on PHP 4). A decent browser (I’ll be using Firefox 2.0.0.1). A decent text editor and/or IDE that supports Unix line breaks if you download my set of files (I’m using the best web development IDE in the world, Quanta). All code in this tutorial is released under the Modified BSD Licence. You might want to download yourself the finished project now, so you can see how it works and if you’re not rewriting it yourself and just stepping through my code. Diagrams are always good, so let’s briefly look at what we’ll be doing (click to enlarge, or grab the PDF). That’s roughly how our system is going to work. Our list of products that will appear in the <select> list will be populated by PHP on the pageload and for this tutorial, the product data that we’ll be using will be hard-coded into PHP. There’s no reason why you couldn’t populate the list and fetch product details using a database, but to keep it simple, we’ll stick with a set list for this tutorial. We will write it so that it’s easily modifiable, though. Here’s data.php, which contains our product information.